Wyndham Vacation Rentals: On the Fly — Not! Fly Fishing is anything but — "On the Fly." It is peaceful, relaxing and demands a slowdown to the pace of the ebb and flow of the flood tide. This is not to say that the sport is without excitement. In the numerous shallow waterways surrounding Charleston and her barrier islands... there is truly an adrenaline rush in seeing a big redfish tail pop up about 20 yards away from your small flats boat or kayak. Charleston is just plain and simply — fly fishing heaven. The Charleston angler has countless creeks, flats, river marsh edges and other places redfish love to hang out. And, the redfish is oblivious to the Lowcountry angler until that line flies off your reel and the drag sings that "Redfish on the Line" song. Several bait and tackle establishments throughout the Lowcountry teach "How do I catch a redfish with a fly rod?" — in both classes and one-on-one instruction. There are many educators that can also teach fly tying. After budding anglers are taught how to cast a fly rod, they usually hit a local freshwater pond to practice casting on bream and bass. Some dive right into saltwater fly fishing. 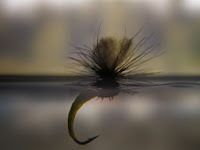 The selection of the fly is very important as the angler's first step. Bait is, obviously, key. Redfish love to nosh on fiddler crab and shrimp. If baitfish are visibly swimming all over the shallows you are fly fishing in, it is more enticing to the redfish to do a crab pattern or shrimp bait. Prepare to enjoy your peaceful, plus exciting, experience in the Lowcountry saltmarshes. Pluff mud is some sticky stuff, and you don't want to sink into it — stay in the marsh grasses. You will likely have some friendly dolphin dancing near you — a great up-close-and-personal experience! Listen to your instructor and/or guide. Don't forget the sunscreen, and bring some refreshments and plenty of hydration. You will have a great time, regardless — but, hopefully, at the end of the day you will be taking home a photo of yourself with your big "catch & release" redfish.